Raleigh Curtis officially retired from his senior management position at Mid Columbia Producers (MCP) on May 31, 2009. He will still be advising MCP for the next couple of years and has kept the title of “Grain Position Manager.” However, we won’t see him in the office much anymore. I’ve known several good coop managers during my 35 years of farming, which included serving 11 years on the Sherman Cooperative Board. Raleigh is the best — both as a manager and as an innovator. In his decade managing MCP, Raleigh’s achievements include: dramatically increasing MCP grain trading income by using his knowledge of hedging and futures markets, paying off all MCP’s qualified capital credits, and providing farmers with new marketing tools — such as base price contracts that allow farmers for the first time to take advantage of high prices for future crop years. My main interaction with Raleigh has been during his biweekly early morning “marketing meetings.” Although parts of these meetings are used to discuss policy changes or new ventures that MCP is considering, the main focus was always on Raleigh in his favorite role — as an educator. Raleigh is a enthusiastic teacher and delights in challenging the thinking patterns of farmers. When Raleigh arrived, attendance jumped from 6-8 farmers to 15-20 farmers — with more after harvest, when farmers have grain to sell. Farmers come to marketing meetings to learn which way wheat prices are headed. They want to make sales that hit the top of the market. Raleigh played along with this desire to predict, but in his heart I think he knew that farmers are wasting their time trying to predict short-run price movements. Instead, Raleigh tried to convince farmers to change their approach — focus on managing risk and grabbing profitable opportunities. He taught the techniques that made him a successful trader. I sometimes wasn’t convinced by the way Raleigh justified his recommendations. However, if I mulled them over long enough, I always concluded that the recommendations themselves were correct — basically, use all the tools that the government and futures market provide and, most important, sell as soon as you see a profitable price even if it is for a crop that won’t be produced for several years. Raleigh has made a big contribution to our cooperative and to our area. I’m glad he’s planning to stay in Rufus and look forward to learning much more from him in the future. 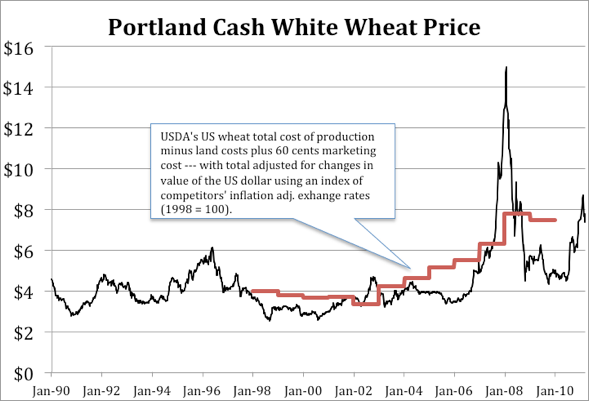 Until May 15, 2009, Mid Columbia Producers is allowing farmers to put wheat into this year’s average price pool. When a farmer enters wheat into the pool, he selects an ending date between August 19, 2009 and February 28, 2010. MCP’s pool manager then divides the amount of wheat by the number of weeks between May 20, 2009 and the ending date selected and sells an equal amount of wheat each Wednesday using the price MCP is then offering for the ending date. I always use MCP average price pools to market some of my wheat. 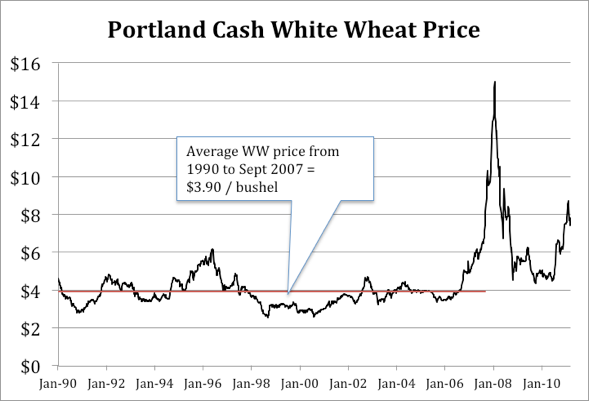 For the 2008 crop, the average price pool (ending October 15, 2008) returned a Portland WW price of $8.45 per bushel. In 2007, 2006, and 2005, the prices I received for wheat entered in the average price pool were $6.44, $4.25, and $3.72, respectively. Last year, for the first time, MCP also offered a “high-risk” pool that it managed. The return on the managed pool (for an October 15, 2008 ending date) was $8.71 per bushel — 28 cents more than the average price pool. I believe farmers should seriously consider putting 10-30% of their wheat in the average price pool. The pool is most attractive when prices in the spring are “high” (as they were in 2008). This year, predicting the direction of wheat prices is more difficult, but plausible arguments can be made that WW prices could be lower at harvest and during the early fall. I regret that this year’s average price pool didn’t start earlier. If prices decline at harvest, I’ll wish I had more $5.70 spring sales in the average. I’ve seen too many floods and and too much erosion during my 35 years of farming. Watching a flood always doubles my desire to take action and we have made progress in reducing erosion by 1) installing many miles of terraces and dams and 2) steadily reducing tillage so more crop residue is left on the soil surface. The next logical step would be to eliminate tillage altogether and go to chemical fallow and direct seeding. Without significant rainfall in August and/or September, chemical fallow does not have enough moisture in the top 6” to germinate fall seeded wheat. The summer sun bakes much of the moisture out of the top foot of untilled ground. Hence, wheat seeded on chemical fallow must wait for fall rains. If rains are delayed until October or November, the yield of fall seeded wheat is reduced. Tilled summerfallow has one big advantage. Properly done, tillage establishes a “moisture line” about 4-5 inches below the surface. Wheat seeded into this moisture will usually germinate, even after long dry periods. I examined the most recent 30 years of rainfall records from the Experiment Station at Moro, Oregon. I estimated that in 15 of the 30 years enough rainfall occurred in August and September to germinate wheat seeded on chemical fallow in late September/early October (the optimum seeding date). Hence, in about half of the years, wheat seeded on tilled summerfallow and wheat seeded on chemical fallow would emerge at the same time. In 10 of the years of the 30 years, significant rains did not occur until October and the germination of direct seeded wheat would be delayed a month. In five of the 30 years, significant rains did not start until November and the emergence of direct seeded wheat would be delayed by two months. Assuming a 50 bushel yield and a $5 per bushel price, a 13% average yield reduction would reduce gross revenue by $32 per acre. The fall of 2008 was very dry and significant rains didn’t arrive until November. The 2009 wheat yields should highlight the yield reductions caused by late emergence. I took the picture below on April 2, 2009. 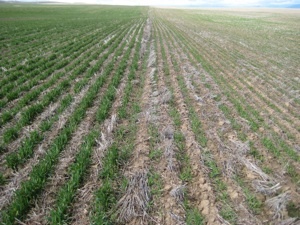 The wheat on the left was seeded in mid September 2008 on tilled fallow and the wheat on the right is direct seeded on chemical fallow. To make direct seeding more profitable in the dry areas of the PNW, new wheat varieties must be developed that produce good yields when the crop emerges late in the fall. Finding these new varieties should be a research priority. In the article, I don’t discuss the differences in production costs between tilled and chemical summerfallow. Tillage can be reduced to one primary tillage plus a rodweeding or two by using a reduced tillage system such as the “undercutter.” Hence, I don’t expect much cost savings when chemical fallow is compared with reduced tillage systems. However, I would be interested in your comments. I have a few additional comments to add — especially about using cost of production in deciding when to sell. Thousands of farmers and traders are trying to profit every day from buying and selling futures and cash wheat. Some of these traders have substantial resources and can quickly spot patterns in the market or important new information. 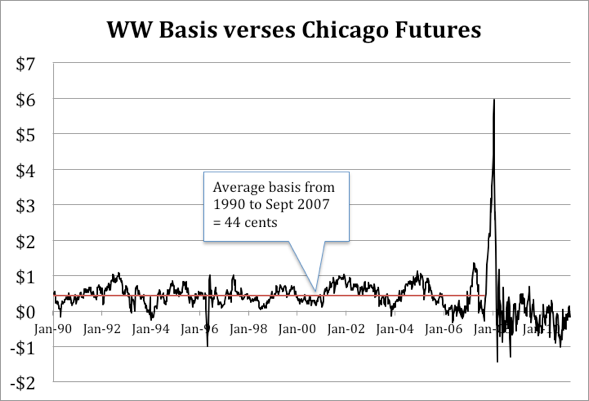 New information is reflected in market prices very quickly, making wheat markets highly “efficient.” For “efficient” markets, future price movements are pretty much random. Consequently, exceptional returns produced by a particular strategy in a particular month or even an entire marketing year are due mainly to luck. Most strategies will produce similar results when the returns are averaged over a ten-year period. For example, if I tell you to sell all your wheat on September 5th every year (you could pick any other day in the year), the average results over a ten-year period will differ by less than 10% from the average returns of any other strategy. The big exception is a strategy that causes farmers to hold wheat too long — so the net return is significantly reduced by storage costs and foregone interest. The “efficiency” of the wheat market is what makes deciding on a marketing strategy so difficult. Since no one knows how a strategy will work in the future, the only way to evaluate strategies is to check their average returns in the past and, as I argued above, past returns (neglecting storage costs) will usually be similar. The people selling marketing advice or writing magazine articles don’t want to be proven wrong. Hence, they usually don’t provide a strategy that covers all the possibilities. If the strategy isn’t fully specified to cover all situations, its average ten-year returns can’t be calculated. The reason I like the marketing framework developed by Professor Larry Lev is that his rules cover all situations and hence can be tested. He calculates that the average return using his rules is approximately 5% more than selling the crop at harvest. Increasing your returns by 5% over selling at harvest is about as good as you can do over the long-run. The manager of our grain cooperative, Raleigh Curtis, is a very knowledgeable trader. Raleigh advises farmers to use their cost of production in deciding when to market their crop. First, farmers should decide on the net return they want, expressed as a percentage of their cost of production. Next, they should calculate the wheat price that is needed to give them their desired return. Raleigh has developed spreadsheets that make calculating this target price easy. Finally, farmers should sell their crop when the market price exceeds their target. He also advises checking the market prices being offered for future crop years and pre-selling part of the crop if the available market prices will produce the desired net return for future crops. I have never understood why cost of production is relevant in marketing wheat that has already been produced. A farmer’s cost of production is very important in deciding what lease terms to accept, what crops to produce, or whether to continue as a wheat farmer. However, once the crop is harvested, production costs are sunk costs and I don’t see how they are relevant in marketing. A farmer wants to use the strategy that will produce the highest average return. Although I don’t understand its rationale, I believe Raleigh’s approach would produce acceptable long-run results if he will just fix one important deficiency. As I’ve argued above, all strategies will produce similar long-run returns as long as they don’t cause farmers to hold wheat too long and rack up unnecessary storage and foregone interest costs. A farmer following Raleigh’s approach this year probably has already priced most of his crop, so excess holding costs are no problem. However, what should a farmer do during a year when the market never offers him a price that will produce the net return he wants? Raleigh needs to provide additional guidance on this issue. I happened to have all the data necessary to test Raleigh’s approach for the nine crop years from July 15, 1993 to July 14, 2002. For each year, I calculated the minimum wheat prices necessary to produce 20%, 30%, and 40% returns and then used these target prices to determine when a farmer using Raleigh’s approach would have sold his wheat. For the 1993-4 through the 1996-7 marketing years, the triggers were achieved before the end of November for all three levels of net returns. During the 1997-8 marketing year, farmers seeking a 20% return would have sold early, but wheat prices never were high enough to achieve a 30% or 40% return. For the 1998 through 2001 marketing years, wheat prices were never high enough to achieve any of the three net return levels. Raleigh has not specified what a farmer should do if prices remain below his trigger price during the entire marketing year. To be able to test his strategies, I assumed that a farmer sold at the end of the marketing year if wheat prices never reached the target. This meant that farmers were holding wheat unsold for long periods during the latter part of the test period, significantly reducing average returns. The average returns for the 20%, 30%, and 40% strategies were 77%, 39%, and 52%, respectively, of the returns achieved by selling every year near September 15th. If farmers using Raleigh’s approach gave up and sold their wheat at the end of November during years when prices stayed below their trigger price, the average returns were much higher — close to or higher than selling on September 15th. Raleigh needs to provide some additional guidance to farmers using his approach to prevent them from waiting too long and having their net returns significantly reduced by storage and foregone interest costs.